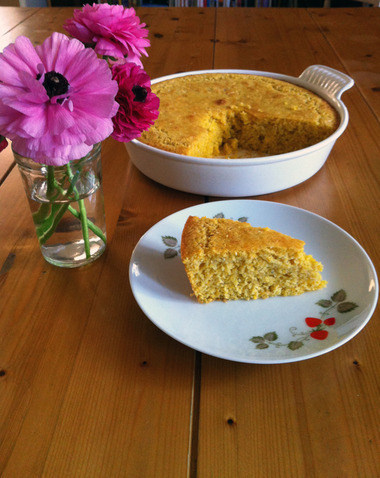 This cornbread receipe emerged victorious after fighting to the death in an arena of other stone-ground tributes. Oops, sorry, that’s the Hunger Games. I’ve been messing around with GF cornbread for what seems like forever. This is the first batch that I’m really happy with. It doesn’t have anything to do with the Hunger Games at all, but I was lucky to catch the film on Friday, opening day, and I was jazzed to be on schedule to watch it (aka I read the book waaaaay in advance, i.e finished book 1 the week prior). The books are better (surprise, surprise) and Katniss, while a fab actress who did an amazing job on-screen, is beautifully solid and perfectly fed, not the chronically underfed underdog in the books. Missing the point, slightly. Preheat the oven to 425 degrees F. Grease an 8-ish” cast iron or enameled cast iron pan with butter or oil. 3. Add wet ingredients to dry mix and stir until there’s no more dry flour floating around in there and then fold in 3 Tbs melted butter. 4. Pour into greased pan and bake for 10 minutes, rotate pan and bake for another 8-10 min, or until a toothpick comes out clean from the center.